Happy 2014 to everyone involved in making open access happen!!! Correction Jan. 10: the 2013 number is 365,000, not 265,000. Thanks to Miguel Navas for spotting the error. Update Jan. 7th: thanks to Wouter Gerritsma via the GOAL open access list for info on the healthy growth of OA in the Netherlands, from 270 thousand OA publications in Narcis in 2011 to 365 thousand in 2013. Congratulations to Narcis and Netherlands OA! That's a lot of people. 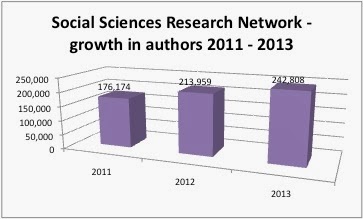 As this chart illustrating the growth of authors participating in the Social Sciences Research Network shows, there are now close to a quarter of a million authors participating in just this one open access initiative, with 66,000 authors signing on in the past two years. The Directory of Open Access Journals continues to add titles at the remarkable rate of 3.5 journals per day, a feat made all the more remarkable by the DOAJ's vigorous weeding project which leaves the total about 200 titles less than on Dec. 11th! DOAJ is about more than a vetted title list, though; it's also a search engine for articles in the repositories. 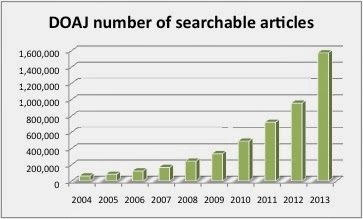 This chart shows that the growth in the fully open access journals listed in DOAJ is at the article level, not just the journal level, with the number of searchable articles growing from under 200,000 in 2004 to close to 1.6 million today. Every day repository services OpenDOAR and the Bielefeld Academic Search Engine (BASE) add a new repository, and BASE grows by about 45,000 documents per day. The Internet Archive (IA) continues to amaze, with over 374 billion webpages archived - and it's good to see that IA is over the top for their fundraising to replace a server destroyed by fire (but more donations to this and many other OA services are always welcome, of course). the data files are available in open document and csv format (proprietary software not required for downloading). The table below illustrates the show growth file. If you are using the data for scholarly purposes, you should cite your source. This is not a copyright issue, it's a question of appropriate scholarly practice. Using this data in a scholarly work without citing the source would constitute plagiarism, a serious offense in academia which can cost students their degrees and scholars their jobs. Aside from the question of plagiarism, when writing scholarly works you should point to your sources so that readers can look up the data themselves. There is no need for copyright! If you are using the data for the purposes of promoting open access, attribution is welcome and encouraged, but please use your judgement. If you're using a few figures on an open access poster or presentation, don't let attribution take away from the effectiveness of your presentation. My hope is that this small step will encourage all of us in the open access movement to move away from our hard critical approaches to move to a new era of open discussion on the nuances of best practices to transition to open access. While I remain firmly opposed to what I consider the overly simplistic and dangerous perspective equating the Creative Commons CC-BY license with open access, I see the value of open sharing of data and would welcome a discussion about how to make this happen.